It's July 4th 2013. Jay-Z's brand new album is platinum via a distribution deal with Samsung. 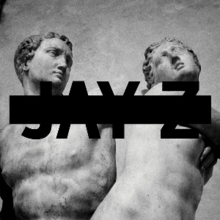 Magna Carta Holy Grail did not release until the 8th. How's that for some numbers? Almost three years later it's safe to say this was a little bit of a flop. 2013 might not have been the best year for rap but picking the best album of the year is often difficult given our (ENTIRE) criteria. It's safe to say this was a very pop, radio heavy album. If Jay is your favorite rapper you'll understand. Jay-Z is at a level it doesn't matter what he releases it WILL go platinum. He's just at that stage of his career. When you're that good you only compare your music to your music. This is near the bottom of the Jay-Z discography stack which says a lot about how good his is. I'm not saying this was complete and utter garbage because otherwise it could not have trumped Nothing Was the Same, Long Live A$AP, Born Sinner and more that released in 2013. It also helps when you have super producers like Timberland, Pharell, No ID and Swizz Beats in your back pocket. Funny enough it was the production of WondaGurl & Travis Scott that produced my favorite jam on there Crowns. As I said earlier the singles were surperb and good enough to get the nod. After much debate in the studio with Queen, Niles, Issah, and others there was no denying this was the album of 2013. Features from Frank Ocean, Rick Ross, Justin Timberlake, and Mrs. Carter herself put this one out of reach that year. Great album at the time, but really lacking in replay value. Perhaps this is opinionated but really think to yourself, when was the last time you listened to F*ckWithMeYouKnowIGotIt on your own time? Read the original review here.